New Rochelle, NY, September 11, 2018–A 10-year investigation evaluating data from four surveillance systems captured information on the geographic distribution of outbreaks of Salmonella enterica serotype Newport infections in the U.S., who is at greatest risk, the rate of antimicrobial resistance of Newport infections, and how often antimicrobial resistance may be linked to an environmental cause of infection. The findings of this 10-year study are published in an article in Foodborne Pathogens and Disease, a peer-reviewed journal from Mary Ann Liebert, Inc., publishers. Click here to read the full-text article free on the Foodborne Pathogens and Disease website through October 11, 2018. "Salmonella enterica serotype Newport is the third most common Salmonella serotype identified among the estimated 1.2 million human salmonellosis infections occurring annually in the US. This comprehensive analysis of four surveillance systems by Crim and colleagues identified key regional and demographic features of Newport infections in the US and provided a broad picture of the epidemiology of this important Salmonella serotype," states Stephen P. Oliver, PhD, Editor-in-Chief, Foodborne Pathogens and Disease and Professor Emeritus of Animal Science & Former Co-Director of the Food Safety Center of Excellence, The University of Tennessee. 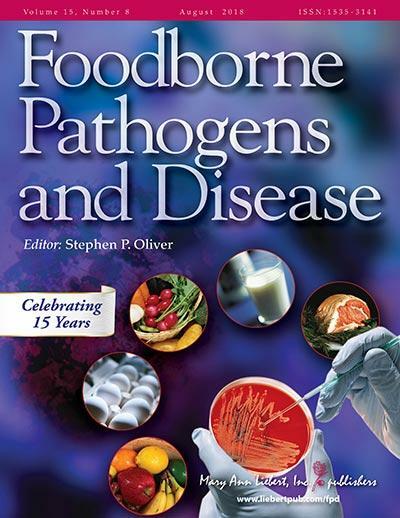 Foodborne Pathogens and Disease is an authoritative peer-reviewed journal covering all aspects of food safety including public health, agricultural sciences, veterinary medicine, and food processing. Topics include emerging and re-emerging pathogens, emergence of drug resistance, bioterrorism and agroterrorism, methods and technology for rapid and accurate detection, strategies to destroy or control foodborne pathogens in food production and processing, and development of novel strategies for the prevention and control of plant and animal diseases that impact food safety. Complete tables of content and a sample issue are available on the Foodborne Pathogens and Disease website. Mary Ann Liebert, Inc., publishers is a privately held, fully integrated media company known for establishing authoritative medical and biomedical peer-reviewed journals, including Health Security and Vector-Borne and Zoonotic Diseases. Its biotechnology trade magazine, GEN (Genetic Engineering & Biotechnology News), was the first in its field and is today the industry's most widely read publication worldwide. A complete list of the firm's more than 80 journals, newsmagazines, and books is available on the Mary Ann Liebert, Inc., publishers website.